According to its website, the Sovereign State of Good Hope is the formation of a new sovereign nation state which is the result of a legitimate and lawful process of secession by the traditional hereditary tribal leader of the Khoisan Nation, Gaob (which loosely translates to King in English) Khoebaha Calvin Cornelius III. This territory includes most of what was formerly known as the Cape Province of South Africa and extends to the northern border of the Cape and ends at the Fish River. The Khoisan are regarded as being the original inhabitants of the area claimed by the Sovereign State of Good Hope. Originally referred to as “Bushmen” or “Hottentots”, the Khoisan pre-date the arrival of the Dutch settlers in Table Bay in April 1652. However, their culture and way of life has slowly been eroded and they are now a marginalised community who claim to have been ignored by the ruling African National Congress government. On 16 July 2018 representatives of the Sovereign State of Good Hope symbolically took down the South African flag and hoisted their own flag in front of the South African parliament indicating its secession. Following its secession from South Africa, the Sovereign State of Good hope aims to implement a policy of Self Determination, rather than being a politically dominating force of corruption. In various interviews, King Cornelius has clearly stated that he has no intention of controlling the resources, rather he wants abundance for all people within the Sovereign State of Good Hope. The intention of the Sovereign State of Good Hope is to restore a state of dignity to those who are impoverished and suffering; to overhaul the education system in a way that teaches compassion and practical skills, whilst eradicating the distortions and inaccuracies from history classes. The Sovereign State of Good Hope intends to assist all people realise their full potential, and to live in a fair, just, peaceful, sustainable nation state. “This is to officially inform you of the decision of the King and the Khoisan people to secede from South Africa. You were given notice of our secession as well as our declaration based on the principle of self-determination and independence to establish the Sovereign State of Good Hope. This letter is to draw your attention to the fact that you have been duly notified of our secession and declaration of independence, and since you have not seen fit to reply, it is an established principle of international law that your non-response may well imply that you not only have been notified but that you have agreed to the terms of our terms of our secession. 2. The recognised Principles of International Law that a State may qualify for International Recognition when it meets the criteria of a permanent population-defined territory and organised level of governance and the capacity to manage its foreign relations”. The king said the template of how the Baltic states were granted their independence from the former Soviet Union was instructive for how he had now declared his state’s independence. “Our situation is really no different to this and modern practices clearly affirm this. The notice went on to demand that all government officials would have to “leave our territory within five days” unless they obtained permission from the king’s officers. They could be registered as “aliens” if they successfully provided documentation “for the circumstances under which they want to extend their stay in the Sovereign State of Good Hope. This would be approved by our authorities on the basis that they are valid reasons in the law for them to remain for a longer period. Other citizens of the Republic of South Africa who remain in the Sovereign State of Good Hope must register within 48 hours that they are aliens. They must then regularise their alien status with our own immigration department to determine the circumstances under which their stay can be extended or the circumstances under which they should be leaving immediately. We write to inform you that our foreign relations with the Republic of South Africa are meant to be peaceful and constructive and that we will work with you and collaborate with you in all ways that will advance the policies, purposes and principles of the United Nations Charter. The King signed the notice and stamped it as being from the “Royal House of the Khoisan”. There has been no response from the South African Government. The flag of the Sovereign State of Good Hope has a thin vertical stripe at the hoist, with the remainder of the flag being divided diagonally from top left to bottom right. 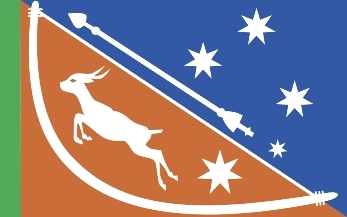 The upper triangle is light blue and contains three large, and one smaller, white seven pointed stars and a traditional Khoisan arrow, also in white. The lower triangle is liight brown and contains a leaping antelope and one seven-pointed star, within a traditional bow, all in white. The string of the bow forms a fimbriation between the blue and brown triangles. 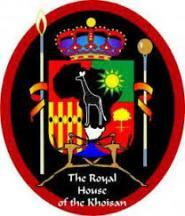 Official correspondence and its website also feature a logo of The Royal House of the Khoisan which is illustrated above.